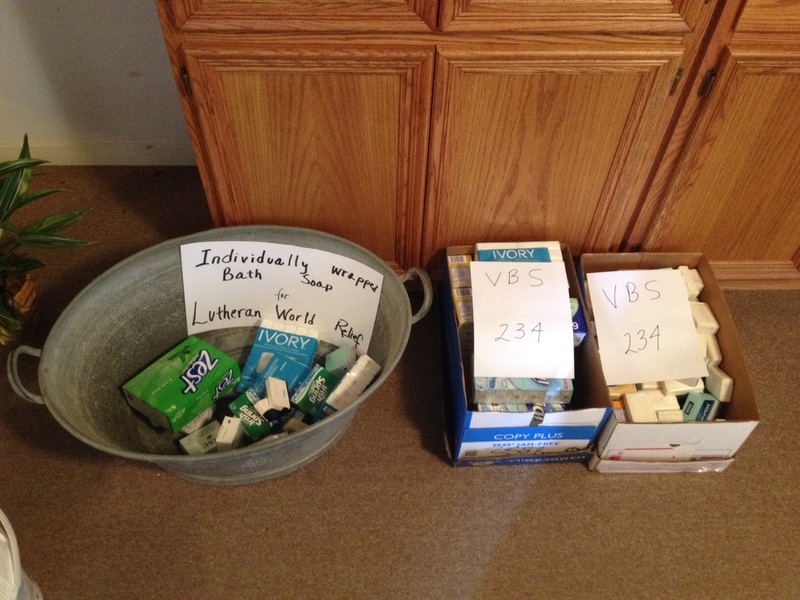 The results are in for the Vacation Bible School (VBS) Bar Soap Challenge. The students of the 2014 VBS at MLLC collected 246 individually wrapped bar soaps. These were collected during the week of VBS: August 21-27. During the 2 weeks following that the congregation was challenged to meet this total. The congregation collected 198 bars of soap. For the sake of those in need around the world we will continue to collect these individually wrapped bar soaps through Resurrection Sunday 2015 – April 5, 2015. We will also receive monetary donations to cover the cost of shipping these items. Most importantly, please remember to pray for the ministry of Lutheran World Relief, and for those individuals who will eventually receive these items. The real winners in this challenge are our neighbors around the world who will get to use the soap for personal hygiene. The soap will be passed along to Lutheran World Relief for distribution to people in need around the world. Thank you to everybody who participated in this special project. We look forward to the continued collecting of bar soap for the months to come.